The city of Udachny is located in the north of Siberia about 10.5 miles from the Arctic Circle. 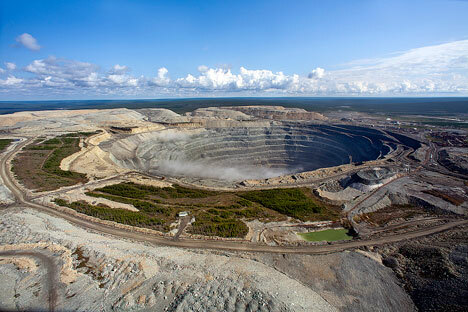 Today it is one of the major northern diamond-mining cities. During the Soviet era, large cities were built around major factories called city-makers. Life in Udachny began in 1954, when Soviet geologist Larissa Popugaeva opened a kimberlite pipe nearby. The marketing system is built on the signing of long-term contracts with companies that produce diamonds and diamond jewelry. The company’s sales organizations have offices in all of the major global diamond centers, including in the United States, Belgium, the UAE, China, the UK, and Israel. “If we currently extract 132 tons of ore a year, then next year – with the launch of the mine – the planned volume is 480 tons. The mine can be worked on for a long time – the projected capacity of the field is calculated at 60 years and proven reserves already total 159 million tons,” he added.